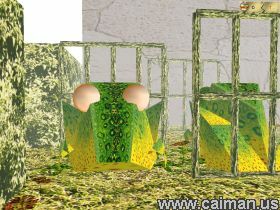 Caiman free games: Abashera Revamped by Max Magnus Norman. 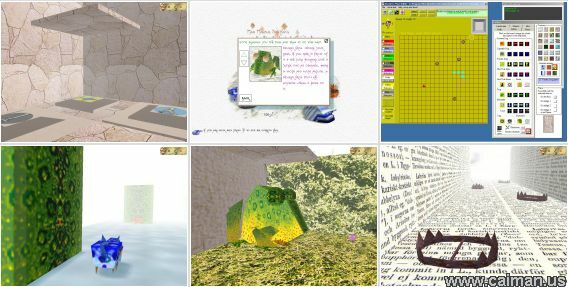 Abashera revamped is an addictive 3D first person IQ adventure maze game with over 50 mazes of varying dificulty which can be played in any order. At the beginning of each level the secondary goals are specified, but the final goal is to exit the maze by going into the spinning sun. You must remember that ALL goals must be met before you can complete the puzzle. There are no guns, no weapons, no tedious bosses. You must rely on your intelligence to survive. There`s no linear plot, you choose from session to session which mazes you shall explore. The missions vary: Kill all beasts, kill no beasts, find the Holy Grail or find the Ark of the Covenant, pick a certain number of diamonds, mushrooms, flowers, strawgoats or eggs, etc. The mazes are populated with a number of more or less smart critters such as: Commie Dogs and Capitalist Dogs, The One Who Sees, Blocker Frogs, Monobites, the deadly The One Who Hears and many more. 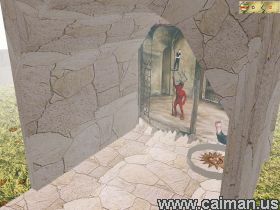 You will have to be a real Theseus, study the monster`s behaviour in order to outsmart them and survive. The in-game music is popcornish electro pop MP3 music. Four full length tracks are included, one with lyrics. Optional: joypad/joystick or a similar device. NOTE: If the game plays to fast or to slow, open up the "performance" settings and change the "game speed delay". If you want to exercise your grey matter and you`re tired of 3d shooters but like the 3d graphics, this is THE game for you.